Home made potato gnocchi made from scratch are the best! They are so much better than chewy store-bought ones. I’ve only posted about potato gnocchi once before: gnocchi with gorgonzola was the first recipe I ever posted on this blog. The city of Sorrento is near the island of Capri, the island that gave its name to the famous Insalata Caprese with tomato, mozzarella, and basil. You can think fo Gnocchi alla Sorrentina as the gnocchi version of this salad, because the gnocchi are dressed with fresh tomato sauce, mozzarella, basil, and parmigiano reggiano. This combination is always a winner, and it is even more so with feathery light homemade potato gnocchi. I prefer to cook the potatoes for the gnocchi sous-vide, but you can also bake them in the oven. 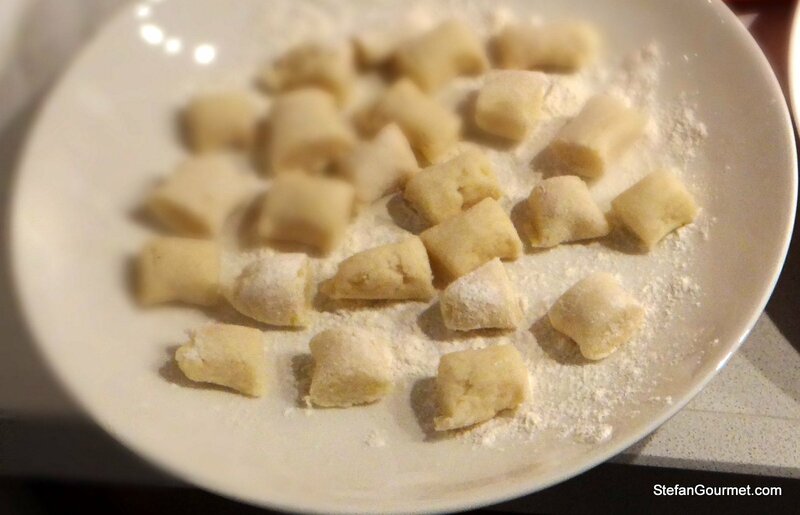 The secret to tender gnocchi is to use as little flour as possible. 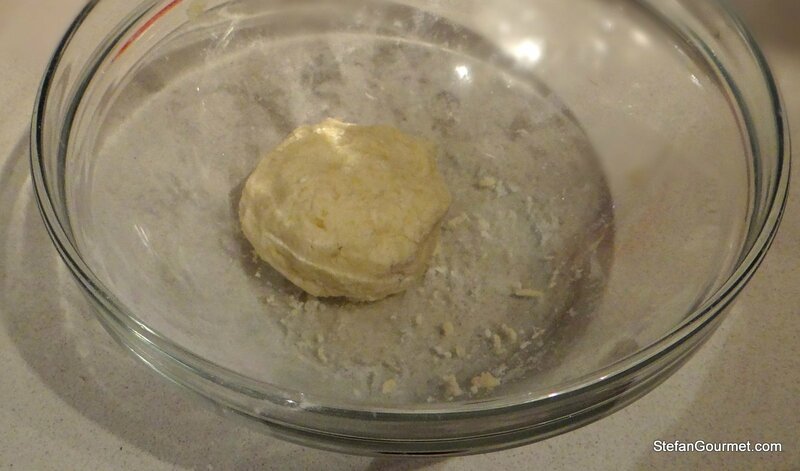 The flour is needed to help keep the gnocchi together, but the gluten in the flour makes the gnocchi chewy if you use too much. Try to use just a bit of flour. If you are unsure if you used enough, just try to cook a single gnocco in gently boiling water. 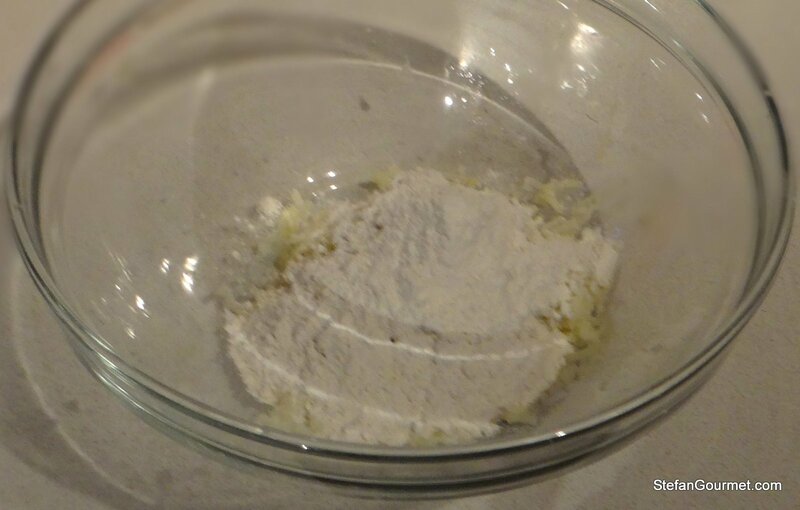 If it falls apart, add more flour to your dough. If it stays together, you’re all set. 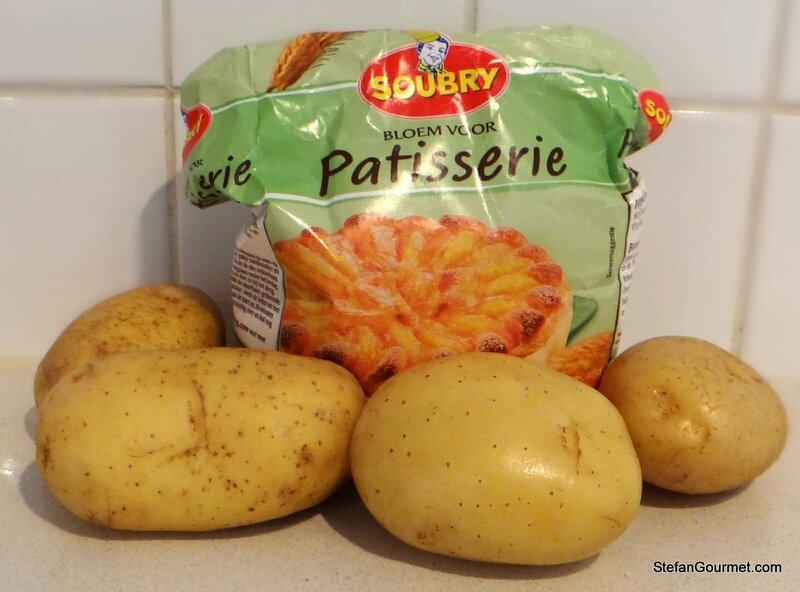 The less moisture there is in the cooked potatoes, the less flour you need to use. That is why baking or cooking sous-vide is better than boiling in water, and why floury potatoes are better than waxy potatoes. Making your own gnocchi is really not that hard at all. Here’s how to make your own lovely gnocchi alla sorrentina. 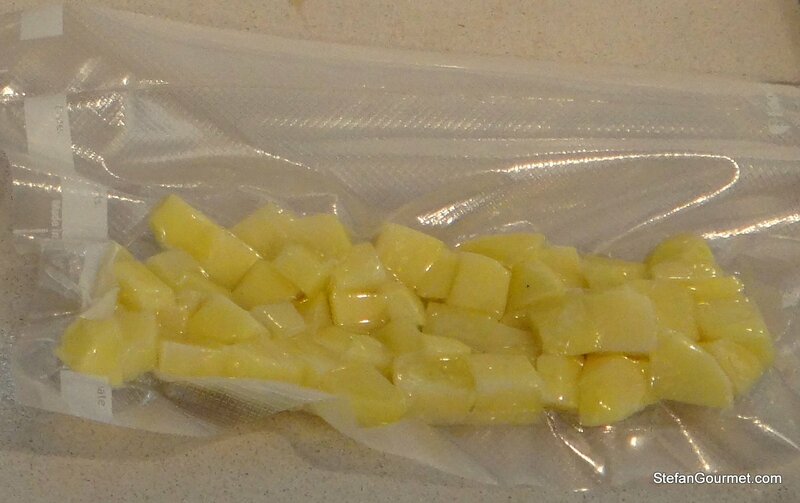 If using sous-vide, peel the potatoes, cut them into cubes, vacuum seal, and cook for 1 hour at 84C/183F. Otherwise, pierce the potatoes with a fork and bake them for 1 hour at 180C/350F. Remove the skin after baking them. Meanwhile, make the tomato sauce. 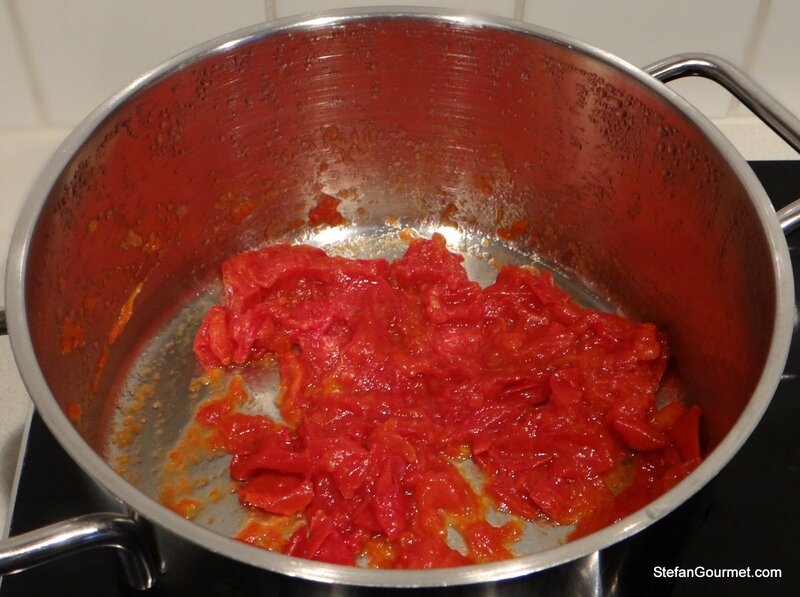 I saw an interesting new way to make a fresh tomato sauce on GialloZafferano. You don’t have to remove the skins for this one, but do remove the seeds and the green part. 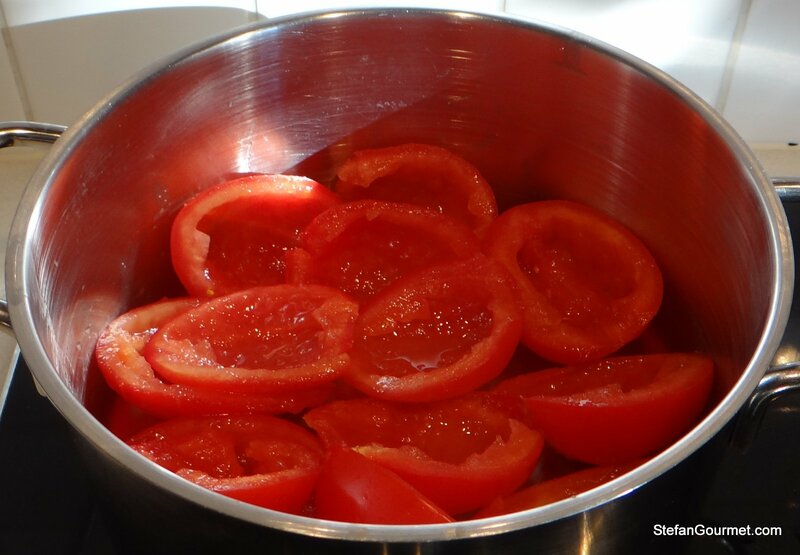 Put the tomatoes into a saucepan. 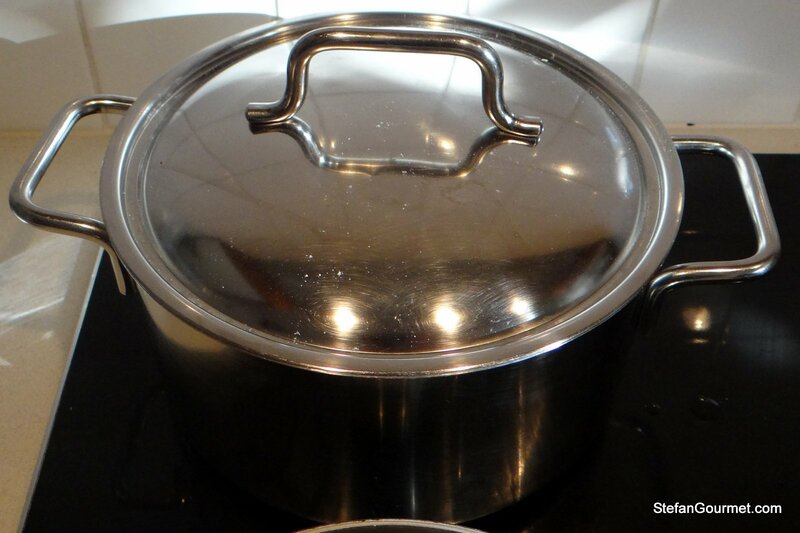 Cover the saucepan and cook over low heat. 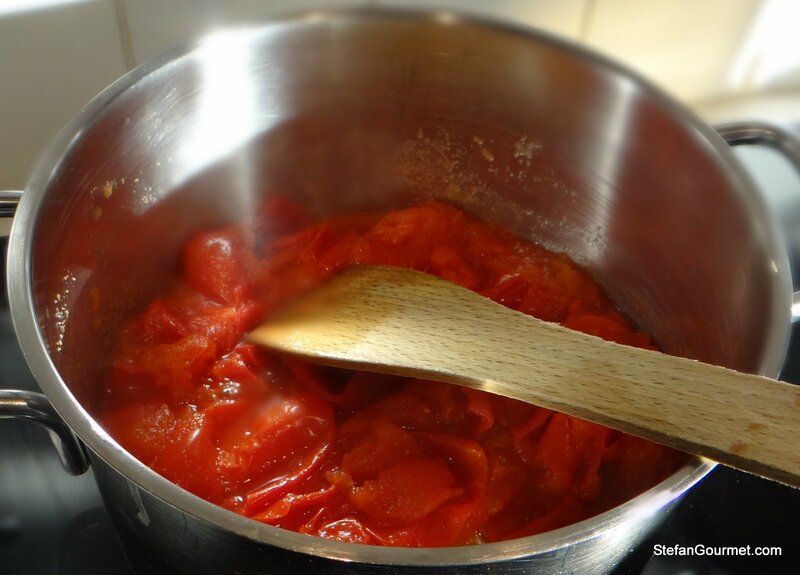 Continue to cook the tomatoes over low heat, stirring now and then, until they very soft, about an hour. 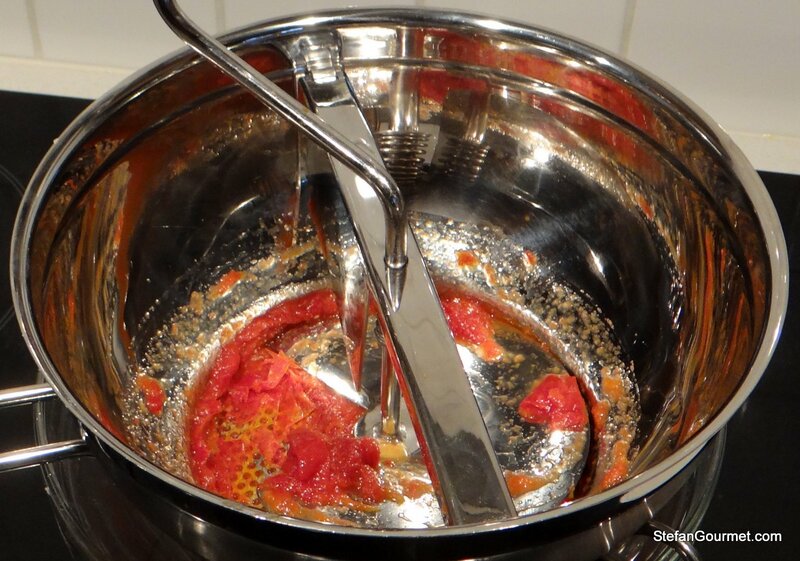 When the tomatoes are very soft and the juices have been reduced, transfer to a food mill. 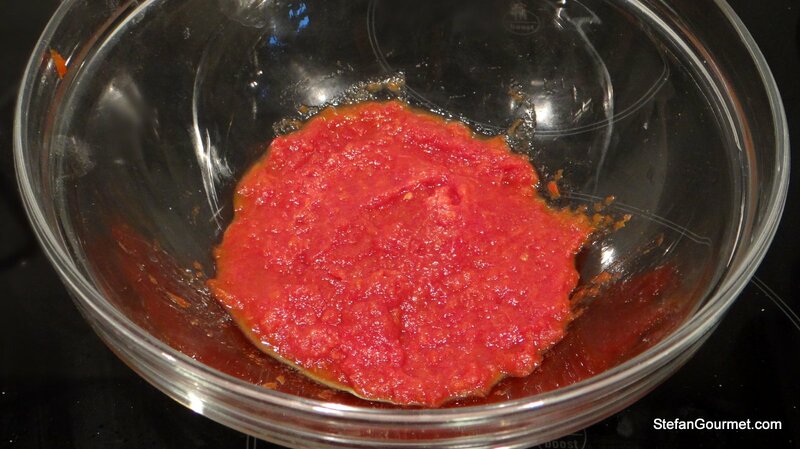 Use the food mill to obtain a smooth tomato sauce without skins. Stir a bit of salt, pepper, and extra virgin olive oil into the sauce. If needed you can reduce it a bit more over low heat, but the sauce should be rather thin for the gnocchi. When the potatoes are done, use a potato ricer to reduce them to a puree. Knead just enough to let the dough come together. Too much kneading will develop the gluten, leading to tough gnocchi. 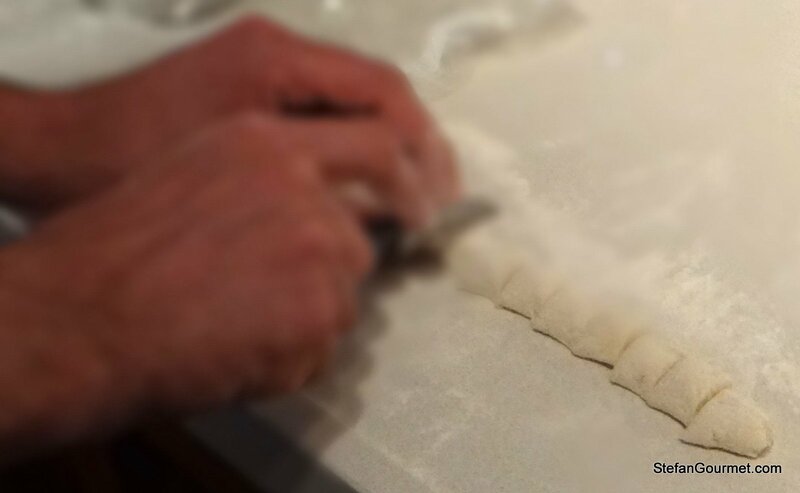 Take a piece of dough and roll it out on a floured work surface until it is about as thick as your finger. Arrange the gnocchi on a floured plate or tray and continue until you have turned all of the dough into gnocchi. 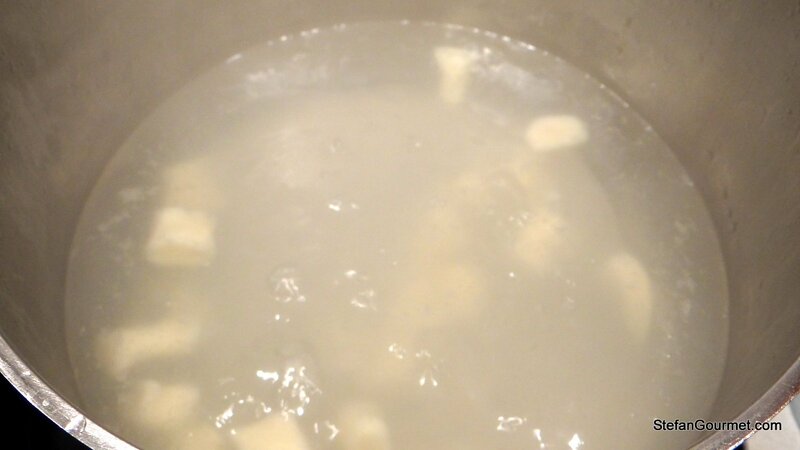 Boil the gnocchi in salted water until they rise to the surface, then take them out with a slotted spoon. 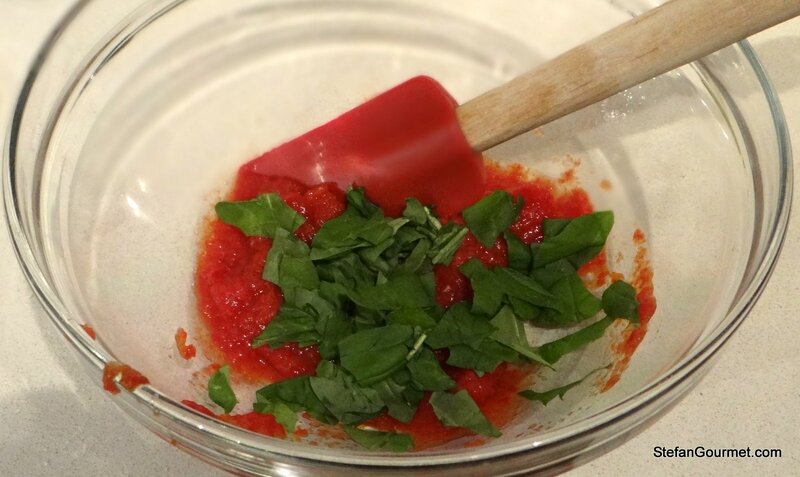 Tear the basil into pieces and add it to the tomato sauce. Cut the mozzarella into pieces about the size of the gnocchi. 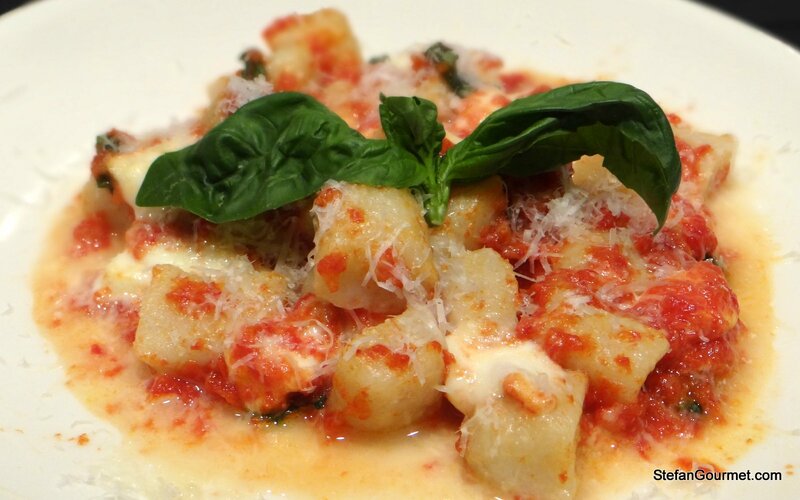 Mix the cooked gnocchi with the tomato sauce, basil, and mozzarella. Arrange the gnocchi on individual oven proof dishes or plates. 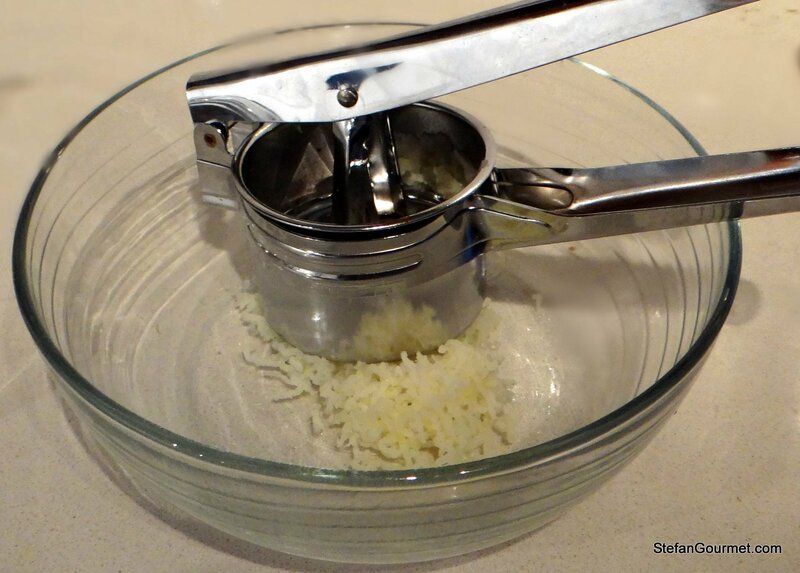 Sprinkle with freshly grated parmigiano reggiano. Put the gnocchi under a hot broiler for a few minutes until the cheese has melted. Serve with some additional parmigiano and basil. The fresh tomato sauce pairs well with a nice dry rosé. These look absolutely delightful and the gnocchi pillow soft! Great tip about testing a piece of gnocco in boiling water first. Confused, however, re the mention of gluten … I thought potatoes were basically gluten free foods, suitable for celiacs? Thanks Jo. You are absolutely correct that potatoes are gluten free. The gluten are in the flour! That is why to get soft gnocchi you shouldn’t knead too much (which develops the gluten), use as little flour as possible, and use ‘farina debole’ (flour with low gluten content, contrary to manitoba). I haven’t made gnocchi since I gave up gluten, but an Italian friend assures me that with potato flour she has great success. You’ve inspired me to put GF gnocchi on next week’s dinner plan, your look wonderful! Thanks for the inspiration and the motivational push! I couldn’t live without pasta 😉 I know that some Italians use part potato starch and part flour in their gnocchi, but I’ve never seen them with potato starch only. I’d worry they won’t hold together, but perhaps adding an egg yolk could help if that were to happen. Love the new way to make tomato sauce!! 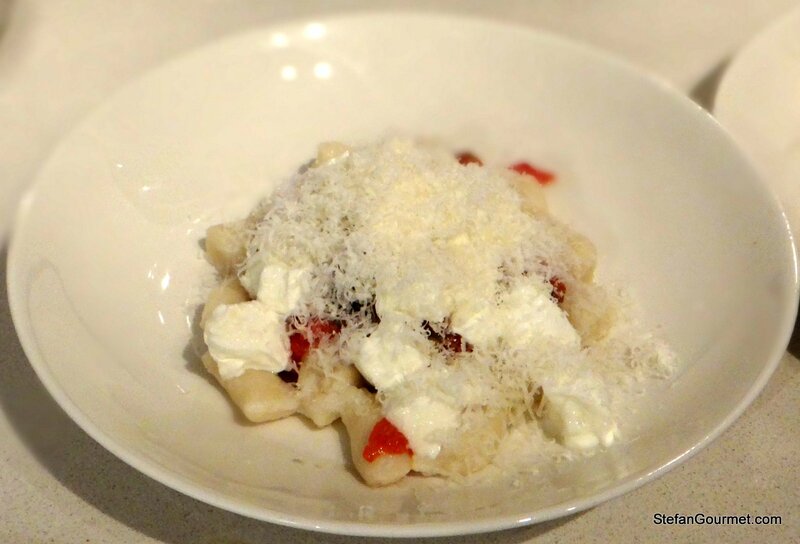 And I am inspired to try to make gnocchi – another great post Stefan !! I have never made gnoccchi and to be honest, had it only a couple times. Your presentation is tempting. Hi Stefan, they look great and just like my grandma’s: don’t worry about the grooves — she never bothers and they are just fantastic! I will have to try gnocchi again, last time i ended up with a pot of floating mashed potato, but this looks soo good. Sorry to hear that — hope you’ll try again. When you do, my advice would be to try a single gnocco first as described in the recipe so you won’t end up with floating mashed potato after all of that work. I am buying a food mill and a potato ricer so I can make this recipe. It looks fantastic, fabulous, delicious. 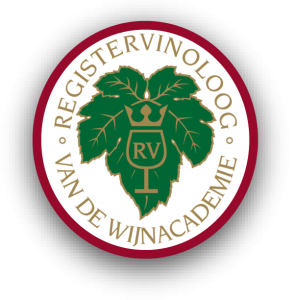 I love that you do not neglect the wine pairing – a dry rosé sounds lovely. Thanks Shanna — Would love to hear how it turns out!